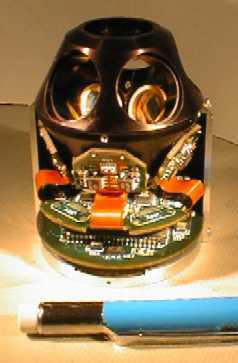 The most widely used trackers use magnetic fields. They are small and unobtrusive, do not suffer from line-of-sight limitations, and recent models have both high update rates and low latency. They have limited range, however, and give distorted readings at long ranges because of metal and electromagnetic interference in the environment. We have designed and built an optoelectronic tracking system that overcomes these limitations. The system uses user-mounted optical sensors (lateral-effect photodiodes) which look upward to view infrared light-emitting diodes (LEDs) installed in special ceiling panels. Using the known location of the LEDs, the known geometry of the user-mounted optical sensors, and a new algorithm called SCAAT tracking, the system computes and reports the user's position and orientation. The HiBall tracking system resolves linear motion of less than 0.2mm and angular motions under 0.03 degrees without the distortion seen in magnetic trackers. The update rate is greater than 1500 Hz and latency is about 1ms. To our knowledge, this was the first and remains the only demonstrated scalable tracking system for HMDs. The ceiling panels were designed to substitute ordinary ceiling tiles in a standard acoustical grid (2'x2' panels). The freedom from needing a precision superstructure and rigidly aligned panels is granted by the online autocalibration capabilities of the SCAAT algorithm. The working volume of the current system is greater than 4,000 cubic feet (greater than 500 square feet of floor space, greater than 8 feet of height variation). This area can be expand simply by adding more tiles, or by using checkerboard configurations which spread a given number of tiles over a larger area. 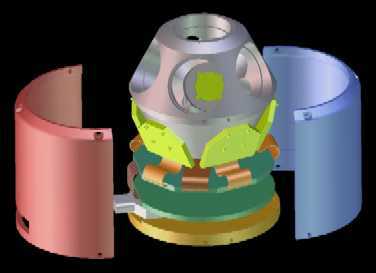 The HiBall is a cluster of 6 lenses and 6 photodiodes arranged so that each photodiodes can view LEDs through several of the 6 lenses, providing 26 view frustra originating at the HiBall. The assembly will include signal processing and A/D conversion circuitry. The total weight is about 5 ounces, making it lighter than just one of the cameras in the previous generation ceiling tracker. The HiBall and the ceiling panel are synchronized by a custom interface board which allows very high rate of LED sightings. The hardware alone can perform more that 3,000 sightings per second, while the whole system tracks using about 1,500. 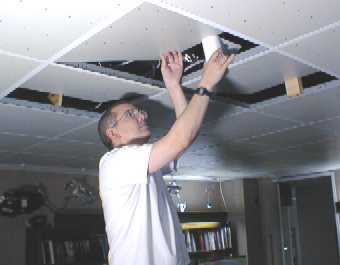 The UNC HiBall Tracker relies on the SCAAT (Single Constraint At A Time) algorithm to compute the user's position and orientation from the individual sightings the HiBall makes of LEDs on the ceiling panels. The algorithm makes innovative use of an Extended Kalman Filter to provide position and orientation updates after each individual LED sighting, rather than after a group of several sightings as in the previous generation of UNC ceiling tracker. In addition, SCAAT improves on previously developed autocalibration techniques to allow on-line calibration as described below. For more information see Greg Welch's SCAAT page which includes links to Greg Welch and Gary Bishop's 1997 SIGGRAPH paper on SCAAT. The current ceiling's lower cost design was made possible by an autocalibration process described in Gottschalk93. The SCAAT algorithm improves on this by allowing autocalibration, tuning the actual LED positions, to be performed while the system is tracking. This accommodates shifts in the tiles and LEDs which can occur during normal use. In addition this technique opens possibilities for even less initial knowledge of LED placement than the current ceiling provides. As a test and demonstration of the autocalibration abilities of SCAAT, we have intentionally raised ceiling panels from their correct position. Here Dr. Gary Bishop is shown making the adjustments. The system was given only the initial flat LED positions, but after less than ten minutes of use (successfully tracking with the misplaced panels), SCAAT had accurately adjusted its knowledge of the LED positions through displacements more than 5cm. The above visualization shows the final measured LED positions. Here is a HiBall slide presentation from ACM VRST 99.